Ragù Bolognese is a meat sauce originating from Bologna, Italy. Traditionally, it is cooked slowly to produce a thick and flavorful sauce for broad, flat pasta noodles such as tagliatelle, pappardelle, or fettuccine. Classic Ragù Bolognese incorporates ground beef, pork and veal as well as pancetta into rich, tomato-based sauce. A splash of Italian red wine deepens the flavors as it simmers. This pressure cooker version is ready to enjoy in just under an hour! This MultiPot pressure cooker version of Ragù Bolognese achieves the same mouth-watering results in a fraction of the time. In less than an hour, you will have an easy weeknight dinner that the whole family will enjoy! Heat olive oil in a pressure cooker set to Sauté. Fry pancetta in hot oil until golden-brown, about 5 minutes. Stir onion, carrot, and celery with the pancetta and cook until softened, about 5 minutes; add garlic and cook until fragrant, about 1 minute. Stir tomato paste and red pepper flakes with the vegetables and cook, stirring frequently, until the paste darkens, about 2 minutes. Break beef, pork, and veal into small chunks and add to pan; cook and stir, breaking the meat into small pieces with a wooden spoon, until completely browned, about 10 minutes. Pour wine over the meat and vegetables, bring to a simmer, and cook for 2 minutes; add milk and chicken broth. Seal lid on cooker and cook on High Pressure for 15 minutes. Relieve pressure through the quick-release valve. While the sauce cooks, bring a large pot of salted water to a boil. Cook fettuccine at a boil until al dente, 8 to 12 minutes; drain and transfer to a large bowl. Season Bolognese with kosher salt; ladle onto fettuccine to serve. Be sure to serve this Pressure Cooker Ragù Bolognese over noodles that have been cooked "al dente." This translates as "to the tooth" in Italian, meaning the pasta should still be slightly firm to the bite. Ragù Bolognese can also be used when making a layered lasagna, or even tossed with pillowy potato gnocchi. I used turkey and beef to lighten it up a bit. Was great. My beef was kinda fatty so I had to pour off a lot of fat after browning it. Really great tasting, traditional ragu. I definitely tasted the red wine in this dish, and found it to be very flavorful and aromatic. This was really easy to make in my pressure cooker and I can't wait to make it again. This ragu was really good. It was my first time using beef, pork, and veal together for a meat sauce and it came together well. My only qualm about this recipe is that it included so many diff types of meat. The price just added up, so I used ground beef and pork only. The sauce was really good, great flavor and everything I expected from a Bologna’s. Probably because I left out some ingredients I had more pasta than sauce, but next time I’ll splurge and follow the recipe in its entirety. Used this sauce recipe to make a layered lasagna and it was phenomenal. Don't skimp on the meat either. The different types add so much depth and flavor to the dish. Because I made this years ago the long way and it took an entire day, I was excited to see a quick pressure cooker version. I followed the recipe to the letter and and served it as recommended. However, nothing would stick to the noodles and I realized that unlike other recipes for this, this one lacked the addition of either crushed tomatoes or tomato sauce. So, I drained what was left through a wire strainer and added 24 ounces of tomato sauce to it. That was it! 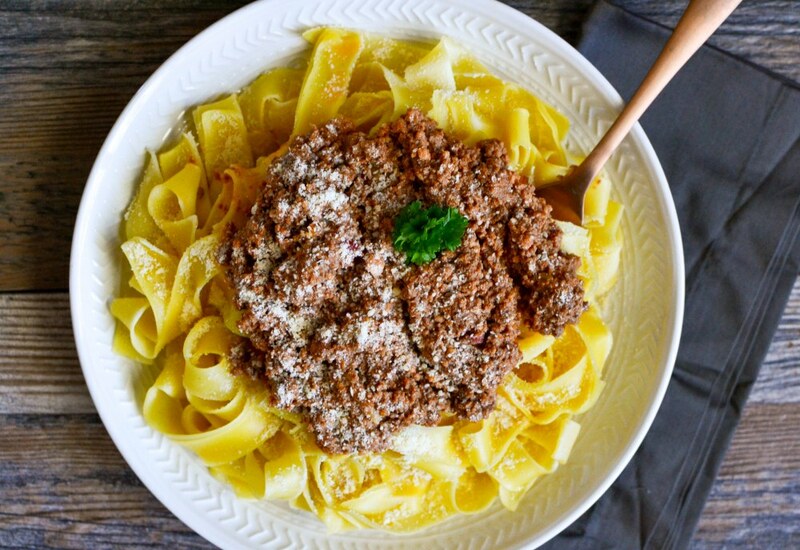 A real Italian bolognese sauce that will stick to the noodles next time. I also recommend because the meat was found sold in packages of 1 lb, not 8 ounces, that the recipe be adjusted for 1 lb of each meat. I was able to easily add a bit more liquid and a bit more of the vegetables to account for this as well. Salut! Initially my husband and I loved the flavors. However about 1/2 way through it started to taste a bit greasy and I was missing more tomato-y flavor. We’re chilling it overnight and hoping to peel off some of the extra grease. Whether I add tomatoes is yet to be determined. What confuses me is it didn’t seem greasy until after it was done. But overall it’s good just need to tinker with the flavors. And it covered our pasta so that wasn’t an issue as was earlier mentioned.